2018 Enfield Custombike Dirty Duck. Picture credits - Enfield. Submit more pictures. What machine says �Survive Anything� more than a Jeep or Land Rover Defender in its characteristic rough metal with a big ol� snorkel sticking out the top� The Dirty Duck is our interpretation of the very same idea in a motorcycle form. The existing angular forms and rigid frame of the Continental GT worked perfectly for conveying this idea of utilitarian toughness. The addition of the hand fabricated snorkel completed the look and ability to go anywhere on land or in water giving it the name � Dirty Duck. Ask questions Join the 18 Enfield Custombike Dirty Duck discussion group or the general Enfield discussion group. Bikez.biz has an efficient motorcycle classifieds. Ads are free. Click here to sell a used 2018 Enfield Custombike Dirty Duck or advertise any other MC for sale. 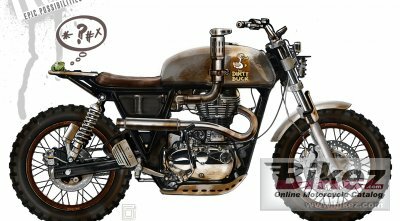 You can list all 2018 Enfield Custombike Dirty Duck available and also sign up for e-mail notification when such bikes are advertised in the future. Bikez has a high number of users looking for used bikes. Before you buy this bike, you should view the list of related motorbikes Compare technical specs. Look at photos. And check out the rating of the bike's engine performance, repair costs, etc.